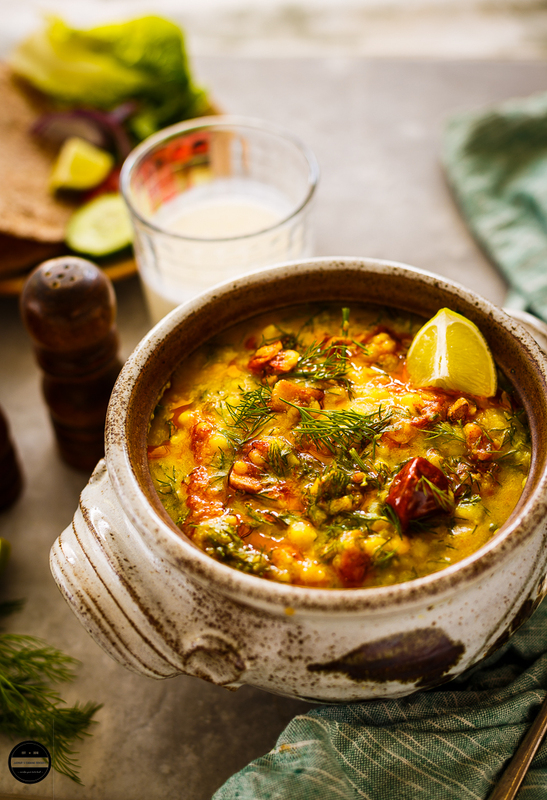 Relish this delicious and nutritious Mixed Lentils and Dill (a.k.a. Suva Bhaji) Daal with steamed rice or hot phulka roti and experience its outstanding taste! This daal is packed with so many depths of flavour and is super good. It is so simple, homely and comforting dish which is packed with protein, vitamins and minerals. 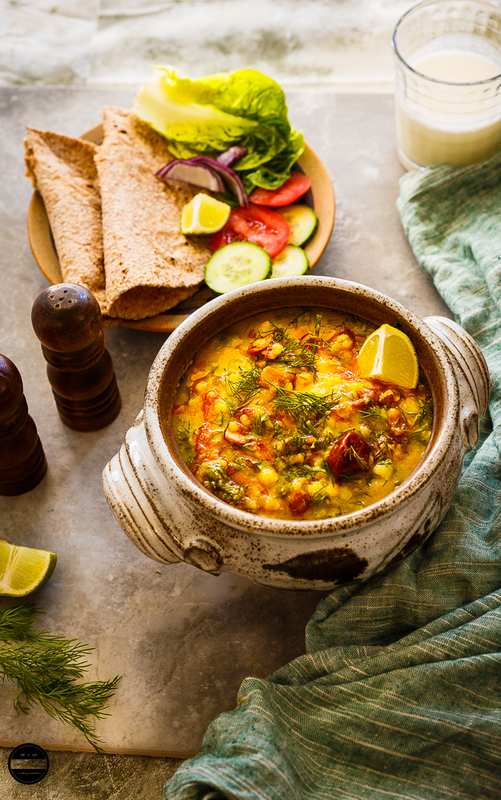 Being a vegetarian family, we mainly rely on lentils and beans for our daily protein dose and I am always in a search for a various type of Daal recipes. I love using lentils and beans when you cook with a variety of spices, herbs or vegetables, it is guaranteed that the outcome will be splendid. Lentils and Beans are packed with protein and fibre and the same time so versatile. especially with lentils, you can create any kind of dish be it starters, main meals, dips, or even desserts. My daughter has a soft corner for the tangy lemony and aromatic Dill-Suva bhaji and many other leafy greens, and my sunny boy can't get enough of any daal. Whenever I am in Indian grocery store I never forget to look out for fresh dill, and if I spot a big fresh bunch of Dill, couple of bunches straightaway goes in my trolly. 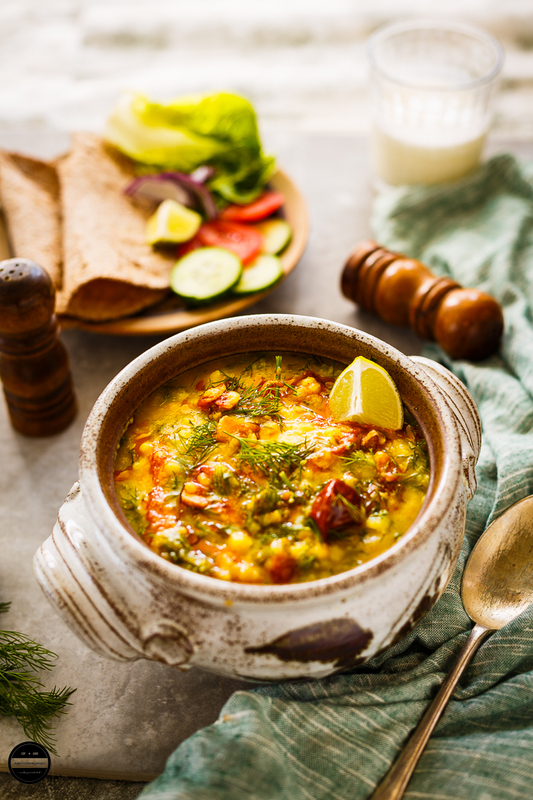 So there for many times, I prepare lentils or beans with leafy greens and herbs Whatever they like to eat but whenever I prepare this Mixed Lentils and Dill Daal, I do not hear about anything else. Fresh Dill and Dill seeds are very popular in Indian cooking. According to health experts, dill is one of the healthiest herb available. It is packed with numerous healthy benefits, It is beneficial for diabetic people and a good source of calcium, magnesium and iron. Dill helps improve digestive system too. This daal comes together in no time. For a wholesome and nourishing meal serve this daal with salad, rice and roti. Only yellow moong daal can be used in this recipe. I have prepared this daal vegan, but if you want to use ghee for tempering, (tadka) free to use. 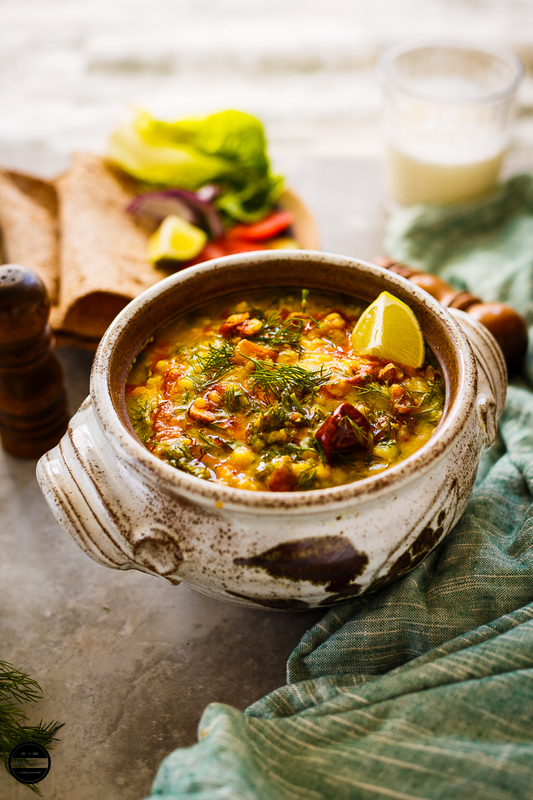 This delicious, hearty and comforting quick mixed lentils and dill-Suva bhaji daal is a great vegan dish for any day.It is healthy, nutritious and packed with flavours. Thoroughly clean lentils and wash couple of times with clean water.Soak for half an hour if you are cooking in a pan. I always cook lentils and beans in pressure cooker. Add daal, water, salt and turmeric powder in a pressure cooker. Put it on a stove without lid, let the first boil come then put the lid on. Cook for 3-5 whistles and switch it off.Let the pressure cooker cool off naturally. Lightly mash cooked daal with the back of the ladle, no need to mash completely. n a heavy bottom pan or kadai heat oil and add cumin seeds.Once they splutter, add hing and onion. Once onion started getting pink, add garlic and ginger. Sauté the mixture for a couple of minutes then add split green chillies.Add chopped tomatoes and cook until completely cooked, then add all the masala one by one. Careful not to burn the spices once you see oil is separating the masala, add boiled daal and check the consistency, if it's too thick add little water. Add salt and bring it to a boil, reduce heat and let it simmer for 10-12 minutes.Now add chopped dill leaves and cook further for a couple of minutes.Switch off the heat.Heat 1tbsp.oil is a small pan, add dried red chilli and thinly chopped garlic, fry the garlic until light brown, then add pinch red chilli powder, once you add red chilli powder, immediately pour on cooked daal. )After pouring second tadka once again re heat daal thoroughly. Squeeze lemon juice and mix well. Serve hot with rice, roti and salad.Enjoy! I LOVE lentils, and I need to start making more vegetarian dinners. Pinned to try later! Gorgeous pictures! I love lentils - I just bought a bag of red split lentils so may try this but with all red. Thank you, looks so flavorful! Lentils are such a fantastic protein and when they are made in a daal like this I am in heaven! Thanks! I love lentils as well. 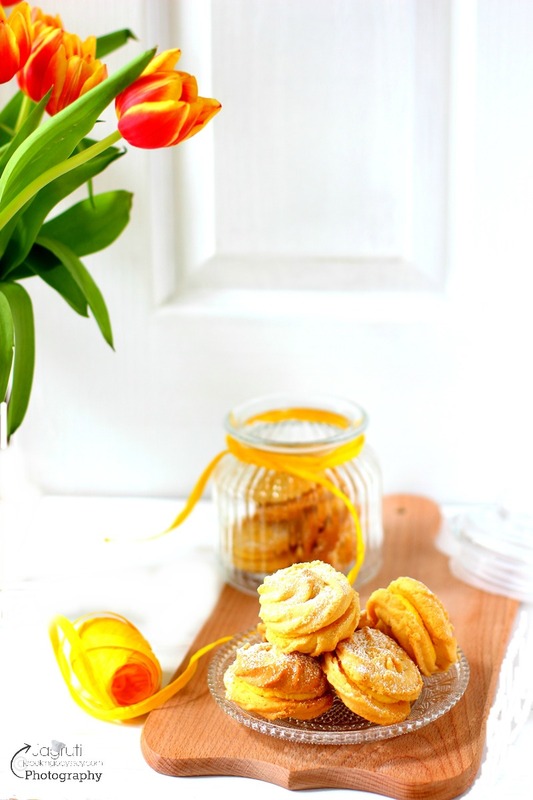 This recipe looks amazing and am definitely going to add it to my collection. What a beautiful dish! I spent two weeks in India and I love the food! Putting this on my list! Your photography is gorgeous! You've made this dish look absolutely mouthwatering and I just want to reach in and take that bowl! This is the prettiest lentil meal I've seen! I also love the ceramic dish you served it in! This is so healthy and the clicks are so pretty! Very interesting recipe.. it looks very rich and full of flavor. I make moong dal with dill but would love to try your way. Beautiful bowl of healthy lentil daal. Pictures are perfect! Beautiful pictures. The dal is my all time favorite. Love the color. I love that rustic pot and i am sure this would taste good. 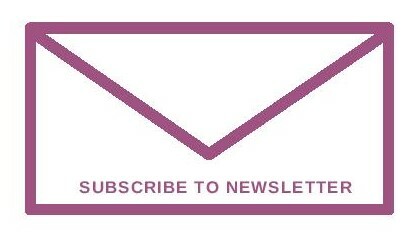 You are my go-to source for Indian cooking, I'm obsessed with everything you make ~ gorgeous! OMG, this looks amazing. I cannot wait to try it. I absolutely love daal. This one looks so much fancier than my regular spinach and coconut daal. NICE! sharing this! I never had Daal. I never knew what was, but you photos wow!!! Now I want a huge portion of it! It looks yummy!!!! This dish looks AMAZING:) I love the colors and I can almost taste the dahl because of your gorgeous photos. Thanks for sharing your wonderful recipes! This dish looks so delectable and the colors are just amazing. I never had a Daal but looking at your pictures made me drool already. Ok so, the soup looks incredible BUT I am absolutely in love with that soup bowl! It's so cute and handmade-looking... I want one. I love all of the flavorful spices in this dish! Dill weed and dill seed are among my favorite! This is my kind of dish - lovely tasty flavours! I've just printed it to try tomorrow. LOVE lentils! We had yellow dal this past weekend cooked in tomato broth. Now I'm dying to try these. They look so hearty and delicious. Yum! every one can easily be aware oof it, Thanks a lot. What a beauty of a dish!! I love lentils and I wanna dig right in!! We are eating meatless several times a week, putting this on the menu! YES!!! I love using lentils to "beef" things up. It is something I find even satisfies meat eaters. Can't wait to try this! Wow your photos are just stunning I want to just dive right in! Dill is my total go to herb, love it. 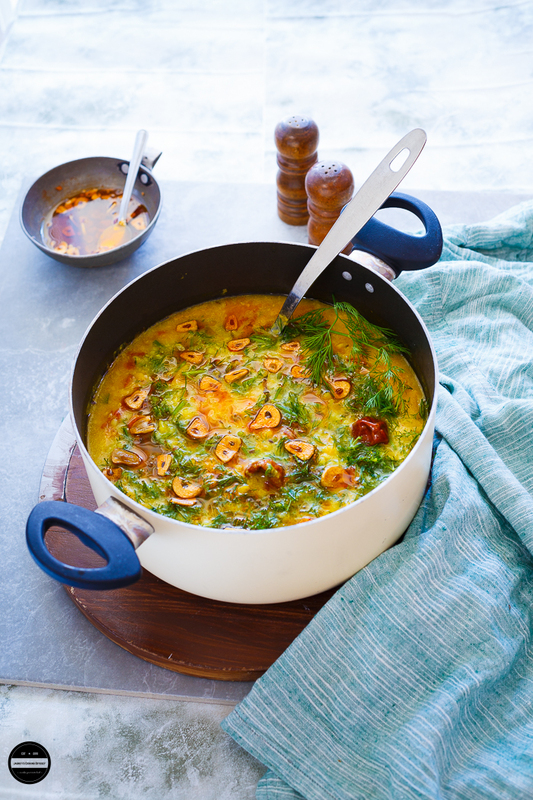 Adore how you have incorporated it in your dahl, yummy!